While I rarely come across three e-liquids that I don’t like in a single review (though it does happen), it’s also rare for me to love all three e-liquids from a single review. Yet that’s the case with the three Highbrow Vapor juices I recently vaped. It was a pleasure puffing away at the company’s Limoncello, Tabac de Perique, and Buttered Rum and Then Some e-liquids. These are definitely three juices that I’d recommend to fellow vapers and want to vape again in the future. Here are the breakdowns and steeping notes. Limoncello: A few Highbrow Vapor fans have said that this juice tastes like lemon Italian ice and I think that description is right on the money. Specifically, it reminded me of the Marino’s Italian ice that I enjoyed as a kid. You get a pleasant and sweet lemon flavor, with a touch of tanginess. Out of the three flavors in this review, this is the most straightforward and probably the one with the broadest appeal. While Italian ice is a treat for a hot summer day, this is a delicious juice any time of the year. Tabac de Perique: Juices made with perique flavor are some the most divisive out there. Perique has a very distinct taste, which some people describe as “musty” or “funky.” Personally, I enjoy perique, but understand why some people don’t. This juice isn’t as “funky” as some of the other perique juices I’ve had because burley tobacco is in the mix. The burley does a great job at complementing the perique and toning down the qualities that some people find overwhelming. It comes together for a very rich and flavorful tobacco blend that’s nutty and sweet. It was tough picking a favorite out of these three juices, but this was the one I always reached for first. Buttered Rum and Then Some: Closing things out is a moderately sweet e-liquid with lots of complexity. 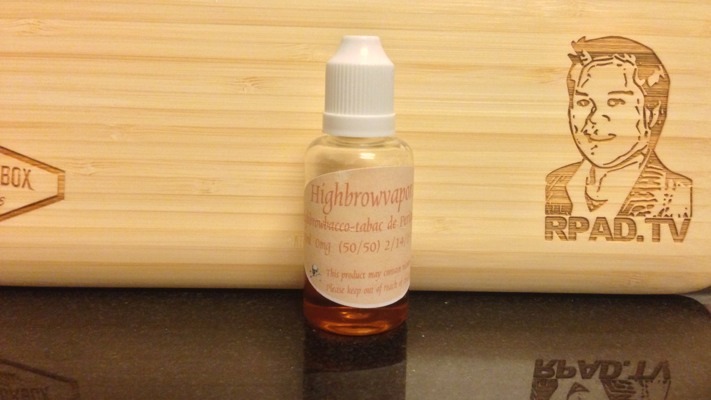 Highbrow describes it as having “buttered rum, vanilla bean, hazelnut, hints of cinnamon, and nutmeg” flavors. The lovely thing about this juice was that different flavors become more pronounced depending on the wattage. For dessert vapes, I prefer juices that have complexity and aren’t overly sweet. With that in mind, this one was an absolute homerun (it’s baseball season!). Vapers that prefer really sweet juices might not like this one as much as I did, but for what I enjoy, it was truly outstanding. RPad.TV e-liquid reviews focus on the flavor of the e-liquids, since throat hit and vapor production can be altered by the PG/VG ratio and nicotine level selected. Each juice is vaped over a period of days in an atomizer, a cartomizer/tank setup, and a clearomizer. The exception is naturally-extracted tobacco (NET) juice; since those are known to clog up cartomizers quickly, those are vaped in atomizers and clearomizers. Previous Previous post: Chewbacca Bathrobe…With Bandolier!